Every student in Groningen is familiar with the Zernike complex. But who is the man it was named after? Hardly anyone knows. Frederik Zernike (Frits for short) was the only Nobel Prize winner from the RUG. He received the award in 1953 for inventing the phase contrast microscope, which enabled researchers to study living cells for the first time. The 10th of March is the 50th anniversary of his death. The famed astronomer Jacobus Kapetyn brought Zernike to Groningen in 1913. The physicist was a loner who liked to assemble instruments. This lead to him inventing the phase contrast microscope in 1930: Zernike demonstrated how light, which is passed through thousands of tiny holes, falls on a panel and is then reflected displays a wave difference; that is phase contrast. Zernike put the dormant physics department at the RUG back on the map. The RUG is still benefiting from his reputation in the international rankings. Even so, little is known about him. An archive is missing, and since Zernike’s Nobel medal went missing during an exhibition about the famous scientist, the relationship between the RUG and his family has been strained. Every student in Groningen is familiar with the Zernike complex. But who is the man it was named after? Not one student can tell you. Despite this, Frederik Zernike (Frits for short) is the greatest pride of the RUG. A brilliant physicist, the man who made it possible to study cells and – not unimportant – the only Nobel Prize winner the University of Groningen has ever produced. Exactly 50 years ago, on the 10th of March 1966, he died. It proved to be a brilliant move: after two years as Kapteyn’s assistant, Zernike progressed to the position of lecturer of mathematical physics. 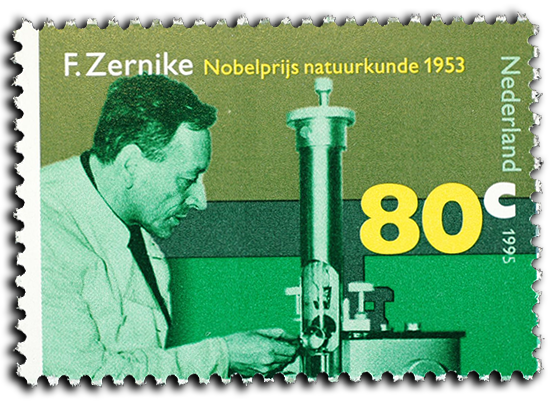 The phase contrast microscope isn’t the only thing Zernike invented in his career. Together with Leonard Ornstein, he derived the Ornstein-Zernike comparison. With this formula, you can make extremely precise photographic masks. Chip manufacturer ASML is still using this formula to make their chips today. Zernike also put together a new kind of galvanometer. With this instrument, you could measure time in a magnetic field, but it was not precise enough. With his own homemade copper wire and many calculations, Zernike improved the instrument. All of this work paid off in 1930. Zernike was studying the refraction of light when something remarkable struck him. He let the light fall onto a so-called grid: a metal plate with thousands of holes which are close together and reflect the light. Zernike saw that two beams of light which had been reflected had a different phase – the waves were not the same. He understood that this principle had enormous possibilities. You could make transparent cells visible under a microscope: the phase contrast microscope was born. The difference in phase ensures that the contrast between the cell and its surroundings are made larger, through which the details can be seen more easily.